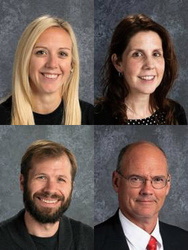 Four Stillwater Area Public School educators are being considered for Minnesota Teacher of the Year! They are among just 132 teachers who were chosen across the state. Read more. 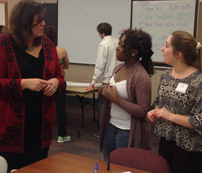 For the fourth time this year, Denise Pontrelli met with students to learn what matters most to them. She's gathered several groups of kids - from the junior highs and the high school - to talk with her about their experiences in our schools. They've shared what's working and what's not working, and even imagined what school could look like in the future. Feedback from students is being shared with district leaders, and will be considered as they plan for the future. Got fresh fruit? We do. Every day our students are offered delicious fresh fruits and vegetables (locally grown when available) as part of breakfast and lunch options. This picture is from our ala carte line at the high school. 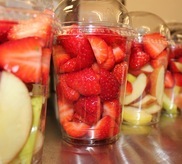 Students can choose from fresh fruit and veggie cups, yogurt parfaits and other healthy snacks. Fresh fruits and veggies are part of every school meal across the district. See more pictures on Facebook. Valentine’s Day is just around the corner! We ask that you help support our efforts to create fun school celebrations that include more activities to keep kids moving, without sugary treats to slow them down. Remember to leave the sugary treats and candy-stuffed valentines at home. Instead, our staff will be providing fun and active ways for our kids to celebrate the season. Learn more about our Wellness Policy. A lottery was held on Monday to establish priority for students who submitted alternate or new open enrollment requests by the January 15 priority enrollment deadline. A separate random drawing was held for each school and grade level, and students were assigned a priority-level based on the Enrollment Options Policy #R.1.4.1. Families will receive information from the district by February 15, 2017 to notify them of a decision regarding their alternate enrollment (or new open enrollment) request. Recognize your favorite teacher or staff member! Know a teacher or staff member who is making a difference in the lives of students? Nominate them for a Partnership Award! Each year, The Partnership Plan honors outstanding members of Stillwater Area Public School staff for their dedication, professionalism, and work on behalf of our students. The deadline for submitting a nomination is January 31. More info. Heard any stories lately of the amazing things a Pony graduate is doing now? Maybe she's working for NASA or caring for patients in war-torn nations. Maybe he's earning accolades for achievements in science, sports, or the arts. Whatever they're doing, recognize them! The Partnership Plan is accepting nominations for the 2017 Distinguished Alumni Award. Nominations are due January 31. Learn more and make a nomination. Check out digital Backpack for information about youth sports, activities, clubs, events and resources for families!